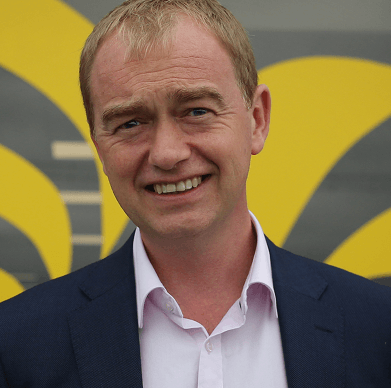 Liberal Democrats leader Tim Farron has vowed his party will be committed to keeping Britain in the European Union (EU) after the next general election. He stated he would be “clear and unequivocal” with voters that if elected the Liberal Democrats would set aside the referendum result and keep Britain in the EU. Thousands joined the pro-remain party after the European Union Referendum on 23 June 2016 in which Britain voted to leave the EU by 52 per cent to 48 per cent. The party stated this increased membership was because “the cheap slogans of UKIP’s Nigel Farage and Tories Boris Johnson and Michael Gove are unravelling, and the public will feel betrayed when promises on the NHS and immigration are not delivered”. The most prominent slogan from the leave campaign was the promise of £350 million per week for the NHS once the UK left the EU. After the referendum result, it was clear this could not happen. The Labour Party leader Jeremy Corbyn stated the party will respect the decision and not challenge the referendum result, leaving the Liberal Democrats as the only party united behind a future for Britain inside the EU. Though the next general election is scheduled for 2020, under the Fixed Term Parliament Act (FTPA), an early election can be called. David Cameron’s resignation and Theresa May’s succession, coupled with major loopholes in the legislation mean it could be called earlier. As at March 2017, Theresa May stated that she would not be calling for an early general election, despite being under pressure to do so at a time when it is most likely to increase her party’s majority in Parliament. It is possible to call an earlier general election under the FTPA if a simple majority of MPs vote no confidence in their own government and an alternative government cannot be formed within 14 days. Alternatively, a two-thirds majority of MPs can call an election with a vote. The Liberal Democrats policy to discount the referendum result is a gamble for the party, which hit a historic low of 7.8 percent at the 2015 general election after a disastrous term in Parliament in coalition with the Conservative party. That five-year period in government saw the party lose almost all of its seats painstakingly won by activists over decades, with just nine now remaining. Copyright © Andrew Stunell - Unofficial Website. All Rights Reserved.